Vatileaks is not over. It may never be True, the Church is 200 years out of date. But not the way you may think. Rome, October 11th. The Pope speaks in front of a half-filled Saint Peter Square. Flanking the altar, the Fathers of the Synod for the New Evangelization and some of the Fathers of the Second Vatican Council still alive. Not all of them could be in Rome. Some of them are very old, and in poor health. All of them have a clear memory of a Council intended to renovate the Church, to find a new way to speak to the signs of the time. Break and continuity. Continuity of the tradition of the faith, break in the way the faith is presented. It may seem odd, but the «continuity issue» was taken for granted by the Council’s Fathers. True, there were already signs of a sort of faith drift, of that new paganism that has always been one of Benedict XVI’s greatest worries. But it is also true that the Council came about when faith experiences were flourishing in many places: the first workers’ priests in France and Belgium, the theological debate on the Sacred Scripture and its interpretation in Germany, the new need for a praxis of interreligious dialogue, the will to lay an ecumenical path with sister churches… This intellectual ferment came directly from faith, and from the need to measure ourselves up to faith. Faith supported by reason is at the apex of Benedict XVI’s thinking. Joseph Ratzinger immersed himself in this notion during his years as a theologian, and as an expert consultant at the Second Vatican Council. Council Fathers were, above all, men of faith. They were men of such honest faith and reason that they did not foresee that the spirit of the Council would be later assessed on the basis of its documents, rather than its intentions. They did not foresee either that, as time went by, the enthusiasm generated by the discussion of the documents and by the Fathers’ reasoning on faith, would decline. To the point of falling to the level of indifference toward faith. This awareness has been somewhat quelled by the post-Council discourse. On Wednesday, October 10th, during the general audience, the Pope was already inviting us all to read the Council’s documents themselves, and not to allow ourselves to be misled by the different papers and books that have concealed, rather than broadcast, what the Council wanted to say. That there is a need for faith is also clear to sister churches. Rowan Williams– Anglican Church primate until December – realizes it, and so he spoke to the synod about the revolution of contemplation. So does Bartholomew I, patriarch of Costantinople, who hoped for full and visible unity among Christians. 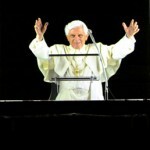 Yet, there seems to be a bit of sadness in Benedict XVI’s mood. October, 11th 1962: Azione Cattolica of Italy organized a torchlight procession in the evening – from Castel Sant’Angelo to Saint Peter Square – to celebrate the just-inaugurated Council. Pope John XXIII bends out of the window and addresses participants, with off the cuff remarks. That famous speech is called «Moonlight speech». «Words full of poetry, of grace, words from the heart», Benedict XVI –bending out of that very same window– tells the participants of a commemorative torchlight march on the 50th anniversary of the first one. There is a need for Faith in order not to lose the spirit of the Council.